Eagle County Colorado State University Extension staff members Jenny Leonetti, left, and Glenda Wentsworth were recently honored by their state and national collegues with a pair of prestigious awards. 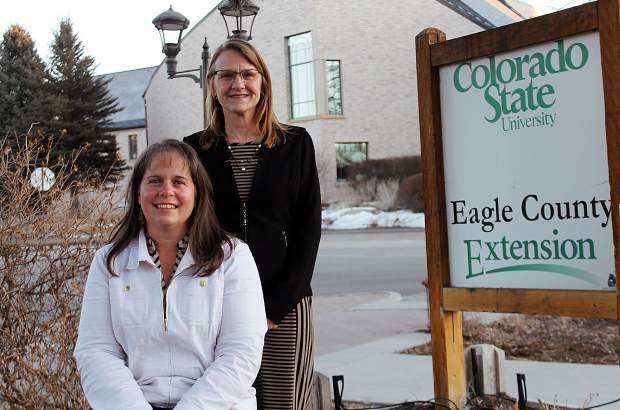 EAGLE — Two of Eagle County’s Colorado State University Extension staff members have been honored for their efforts on behalf of the community. Eagle County Extension Director and Family and Consumer Science Extension Agent Glenda Wentworth and 4-H Club Youth Development Extension Agent Jenny Leonetti have both served the Eagle County community for decades. Wentworth received the Alton Scofield Award for 2017, CSU Extension’s highest state honor. Leonetti received a 2017 Distinguished Service Award from the National 4-H organization, one of only two agents honored in the state last year. Wentworth will mark her 20th anniversary with Eagle County this year. Her recognition with the Alton Scofield Award honors her career-long outstanding performance as an extension professional. Scofield was a longtime executive director of the Colorado Cooperative Council. The council sponsors the prestigious award for professionals in the extension field. Julia Kozusko, executive director of Early Childhood Partners, nominated Wentworth for the award. In that vein, Wentworth said her career in Eagle County has been defined by diversity. During her career she has worked with the Family Leadership Training Institute, Estoy Sano Project, WIN the Rockies, Wellness in Kids, the ServSafe Food Protection Manager Certification Training for restaurant workers and various personal financial management programs that have specifically targeted the needs of county residents. Wentworth has mentored many extension agents, in addition to her Eagle County responsibilities. Wentworth is particularly proud of her work with the Family Leadership Training Institute. This group is an ongoing effort that presents a 20-week training for community members that integrates personal and child development leadership skills, civic literacy and civic engagement. She noted that through the Family Leadership Training Institute, county residents become more involved in their community and in turn worked to make a positive impact for the place they live. “I have been involved in a lot of successful programs for CSU Extension, but this one is special,” Wentworth said. Jenny Leonetti has served as 4-H Youth Development Extension Agent in Eagle County for 14 years. The Distinguished Service Award is a special honor that the National Association of Extension 4-H Agents gives to an individual who has contributed to 4-H club by planning, implementing and evaluating programs that achieve positive youth development outcomes. The 4-H Youth Development Program is the youth outreach program from the land-grant institutions’ Cooperative Extension services and the U.S. Department of Agriculture. The 4-H club program serves as a model for the practice of positive youth development by creating learning experiences, fostering relationships for and between youth and adults and providing safe environments and opportunities for positive risk taking. Leonetti oversees and facilitates the Eagle County 4-H club program with approximately 200 youth learning life skills through various projects such as shooting sports, livestock, clothing construction, cake decorating, foods and nutrition and woodworking. Leonetti manages and supports more than 50 volunteers who create opportunities for local 4-H club kids. Leonetti had high praise for those 4-H club volunteers. Likewise, she praised the opportunities that 4-H club provides for kids. “When you see the impact 4-H (club)makes in the lives of young people, it is exciting to be a part of it,” Leonetti said.